The sun is out and soon the kids will be as well! As school is wrapping up this week and we are prepping for family vacations, summer camps and fun in the sun, we can't help but have our mind on getting outside. Don't let bugs ruin your fun in the sun – protect your family this summer with the new DEET-free Bug Bandit from Fairy Tales. My kids will be headed off to overnight camp this year and bug spray is a must! I already love the Fairy Tale line of hair care products, so I was excited for this product as well. My kids each will be carrying bug bandit with them to help against bug bites as they are exploring the woods and sleeping at night! 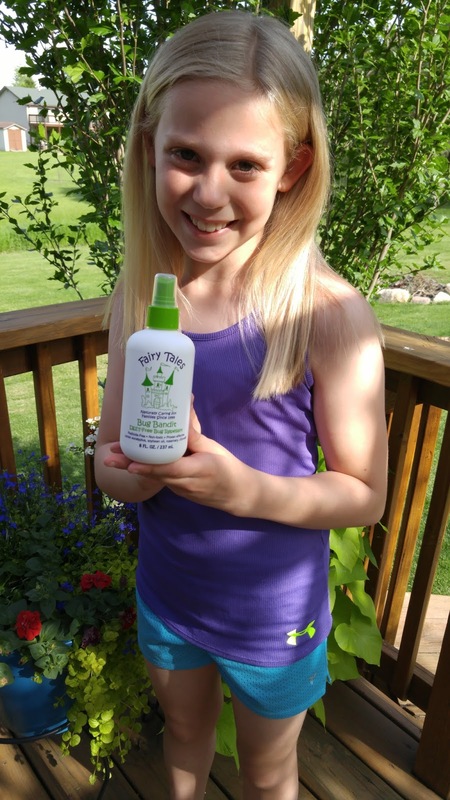 Not only does this bug spray smell great and effective, but it is free of harsh chemicals, pesticides, toxins, parabens, sulfates, dairy, gluten, and nuts that can trigger allergic reactions. So when you are looking for the perfect big-spray to use on kids this summer, look no further than Fairy Tales Big Bandit! It is easy to use, just shake well and spray from head to toe! Use on children over 3 years of age. If applying to the face, first spray on hands and avoid eye area. The effectiveness is based upon scent, so re-apply regularly and generously.